Hemax 2000 UI: Vial of 1 ml freeze dried powder + 1 disposable syringe and 2 disposable needles + Ampoule of solvent of 2 ml: Box of 1. Hemax 4000 UI: Vial of 1 ml freeze dried powder + 1 disposable syringe and 2 disposable needles + Ampoule of solvent of 2 ml: Boxes of 1 and 25. Hemax 10000 UI: Vial of 1 ml freeze dried powder: + 1 disposable syringe and 2 disposable needles + Ampoule of solvent of 1 ml: Box of 1. Hemax 1000 UI: Each vial contains: Recombinant Human erythropoietin: 1000 IU. Excipients: mannitol: 25 mg, sodium chloride: 3.5 mg, monobasic sodium phosphate: 1.4 mg, dodecahydrated disodic phosphate: 4 mg, albumin human: 2.5 mg.
Each solvent ampoule contains: Water for injection: 1 ml. 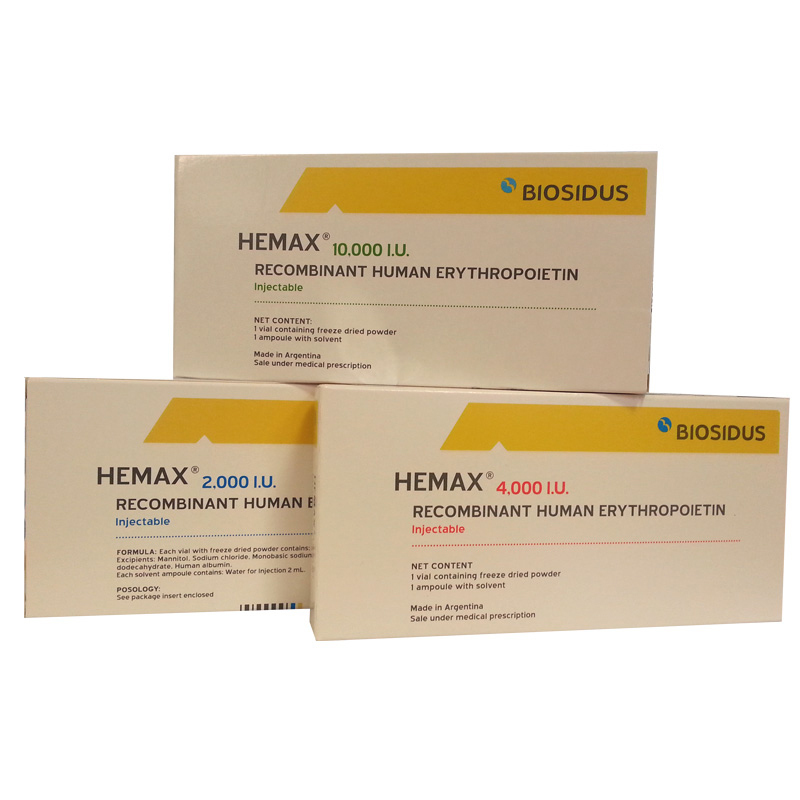 Hemax 2000 UI: Each vial contains: Recombinant Human erythropoietin: 2000 IU. Excipients: mannitol: 50 mg, sodium chloride: 7 mg, monobasic sodium phosphate: 2.8 mg, dodecahydrated disodic phosphate: 8 mg, albumin human: 5 mg.
Each solvent ampoule contains: Water for injection: 2 ml. Hemax 4000 UI: Each vial contains: Recombinant Human erythropoietin: 4000 IU. Excipients: mannitol: 50 mg, sodium chloride: 7 mg, monobasic sodium phosphate: 2.8 mg, dodecahydrated disodic phosphate: 8 mg, albumin human: 5 mg.
Hemax 10000 UI: Each vial contains: Recombinant Human erythropoietin: 10000 IU. Excipients: mannitol: 25 mg, sodium chloride: 3.5 mg, monobasic sodium phosphate: 1.4 mg, dodecahydrated disodic phosphate: 4 mg, albumin human: 2.5 mg. Known hypersensitivity to recombinant human erythropoietin. In the event of an hypertensive episode, liquid overcharge should be excluded. In these cases, it is indicated to strictly treat arterial hypertension using hypotensors, preferably vasodilator agents, before reducing the "dry weight", since this could lead to an additional rise of hematocrit and consequently, a rise in viscosity. If despite the vigorous antihypertensive treatment, arterial hypertension cannot be corrected, it is recommended to discontinue Hemax therapy. Administration of Hemax should be performed under strict monitoring of hemoglobin and blood pressure till the former is stabilized in 10-12 g/dl. If necessary, dose should be raised by 25 IU/kg BW in 4-week intervals, that is, after 4 weeks of initial treatment have elapsed, start administration of 75 IU/kg BW only 3 times weekly, till an optimal hemoglobin level (10-12 g/dl) is achieved (hematocrit 30-35%). When a dose schedule of 50 IU/kg 3 times weekly results in a rise in hemoglobin >2 g/dl a month, dose should be adjusted. The optimal hemoglobin value remains within the treating physician's criteria; in the framework of this treatment and according to the reported experience, the range is between 10-12 g/dl (hematocrit 30-35%). In patients with decompensated arterial hypertension, with ischemic disease and with history of seizures reported in anamnesis, Hemax should only be administered with extreme caution and clinical surveillance. During treatment with Hemax, blood pressure, hemoglobin and serum electrolytes should be monitored. When blood pressure begins to rise, frequently combined with headaches, a vigorous anti-hypertensive treatment should be applied. Patients with blood pressure hard to control should be clinically treated till proper control of blood pressure. Under treatment with Hemax, hemoglobin should be monitored at least once a week till the recommended stable value of 10-12 g/dl is attained. Once this value has been attained, hemoglobin should be monitored every fortnight. During treatment of anemia, a rise in appetite associated to an increase in serum potassium may be observed in dialysis patients. If hyperkalemia occurs during dialysis, dietary regime and dialysis schedule should be adjusted. Increase in blood viscosity due to rise in circulating red blood cell mass may increase heparin requirement in dialysis. Long term treatment: In order to maintain an optimal hemoglobin value of 10-12 g/dl, generally a weekly maintenance dose is sufficient, ranging from 75-300 IU/kg, divided in 2-3 individual administrations. Iron level should be controlled before, and throughout treatment. In the event of iron deficiency, iron supplement should be administered. In patients with aluminum intoxication or infections, the effect of Hemax may be delayed or attenuated. Upon suspension of Hemax treatment, concentration of hemoglobin descends at least 0.5 g/dl/week. No drug interactions were observed in the course of clinical trials. Hemax should only be administered in cases of extreme necessity during pregnancy and lactation. It is not known whether administration of Hemax during pregnancy and lactation exerts any toxic effect on the foetus or if it may influence the reproductive capacity. The following side effects may occur in relation to Hemax administration: arterial hypertension, vascular thrombosis, flu-like syndrome or bone pain, chills after injection, seizures, skin reaction, eyelid oedema, probably of allergic origin. Initial dose recommended: 25-50 IU/kg bolus IV route, or SC route, 3 times weekly. Dose and administration frequency should be adjusted according to each patient’s response. Before treatment is initiated, other ethologies of anemia should be discarded (i.e. B12 vitamin or folic acid deficiency, aluminium intoxication, iron deficit) since contrarily, response to Erythropoietin cannot be guaranteed. Keep in fresh and dry place.